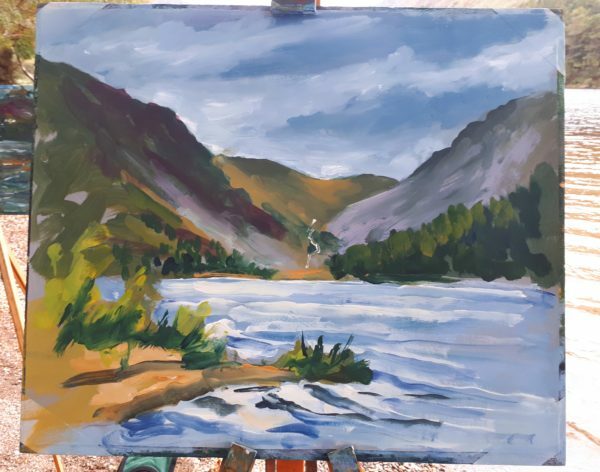 Rod Coyne’s September 2018 Painting Workshop promises quality time channeling St. Kevin’s hermitage on the shores of the upper lake, Glendalough. €20 early-bird discount. Scroll down to book your workshop ticket. “Found yesterday’s workshop with Rod at the Meeting of the Waters in Avoca a thoroughly enjoyable day. Just the most beautiful setting for painting outdoors. All organised to the last detail. Great rapport among the group, facilitated by Rod’s easy manner. I learnt loads, went beyond my comfort zone and feel inspired to get outside to paint more. Many thanks for all your guidance, Rod.” – Finola. 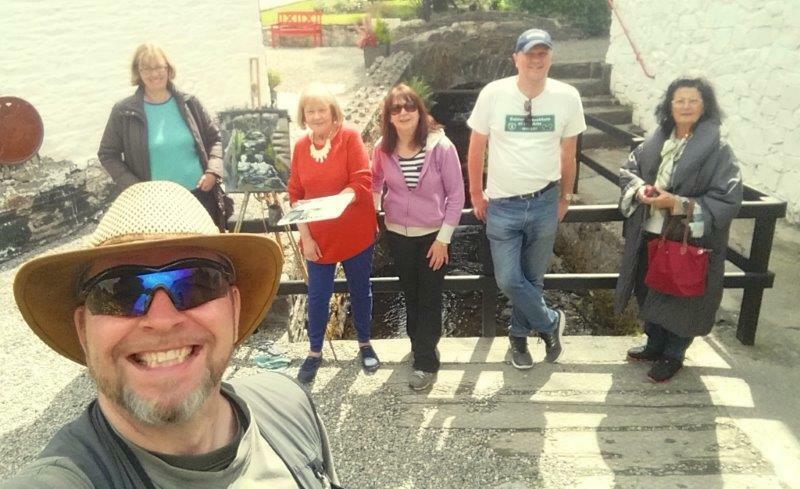 We meet at this scenic Wicklow location at 10am and Rod Coyne will provide a drawing/painting demonstration as introduction before the group start their own art works. Throughout the day Rod always is on hand with individual tips and techniques for all students appropriate to their level. There is a much needed break for lunch before completing the days work at 4pm. The emphasis is on enjoying the painting process in an informal, friendly atmosphere, and as part of a group dynamic. The workshop is suitable for beginners and experienced painters. Materials and equipment such as paint, canvases, paper, easels, drawing-boards, brushes and solvents and rags are to be brought along to the class by the student. A list of essential materials is available on request. Alternatively basic drawing and painting materials and equipment can be provided for a surcharge of € 20 per day. Students can also hire easels separately at a rate of €5 per day. Please note all of the above need to be booked in advance. Workshop T&C’s. More about our workshops on Facebook and Twitter. For every workshop Rod Coyne starts the day with a painting demo. Here you see his latest work presented in front of the Upper Lake, Glendalough. Rod Coyne hosts our Painting Holiday 2018 and this year’s will be 23rd till 27th July 2018 at stunning painting locations in County Wicklow, the heart of Ireland’s Ancient East. Early-birds avail of €75 discount by booking six weeks ahead. Book your ticket at the bottom of this page. Scroll down to book your painting holiday ticket or read our workshop itinerary and T&C’s. 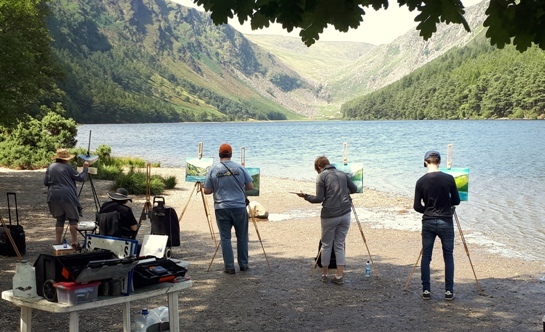 Painting students working on the shores of Glendalough Lake, just one venue in the Painting Holiday 2018. 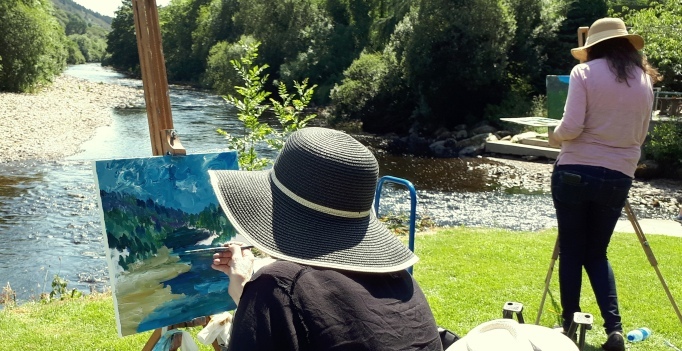 Avoca Painting School’s Painting Holiday 2018 allows you to develop your creative side in the midst of the Wicklow Mountains in the heart of the “Garden of Ireland”. The week is tailored for absolute beginners and experienced painters. Whether you’re starting out and would like to learn new techniques, or have been painting for years and want to take it onto the next level this course is for you. Participants will take home much more than their new creations – working outdoors gives a natural feeling of achievement, fulfillment and recharges the human batteries. Practicing professional artist Rod Coyne, who has over 25 years experience working plein air, will demonstrate all techniques. While painting everyone will be supported with tips and techniques relating to the use of various materials, composition, colour-mixing and brushwork appropriate to their level. Rod chooses each painting location with care and attention to the needs of his students. He is also keenly aware of the roll weather has to play and carefully factors this into each daily scene. In fact the chosen locations will provide plenty for any non-painters to see and enjoy. Painting at the Meeting of the Waters is just one day in Rod Coyne’s Painting Holiday 2018. Not everyone books accommodation with us and we’re fine with that. Many Avoca Painting School students like to take charge and put their own weekend and holiday packages together. We have compiled a list of nearby overnight options to help you book your own workshop accommodation. Workshop host, Rod Coyne, completes his painting demo for eager students. The umbrellas are up but spirits remain un-dampened. “I love hosting the painting holidays because of the group dynamic which builds during the week. We look to create an informal, friendly and fun atmosphere where the art seems to thrive. And it’s always fascinating to see how far students develop during a period of total immersion in paint. I see them leave brimming with confidence, having moved from tentative mark making on Monday to attacking the canvas with gusto by Friday” – Rod Coyne. See our 2018 Holiday Painting Locations. Rod Coyne’s May 2018 Painting Workshop promises quality time channeling the Orient at Knockanree Gardens. Tuesday Morning 6-week Winter Painting Course – SOLD OUT! The Avoca Painting School presents Rod Coyne’s Winter Painting Course at the Avoca Studio Gallery which runs over a 6-week period. The classes are suitable for beginners and advanced painters. Winter Painting Course Early bird discount! Book 3 weeks in advance and save €20. Lose yourself in creative activity with a studio group in the Avoca Studio Gallery with 6 weekly sessions lasting 2 ½ hours each. Receive professional tuition in acrylic or oil painting and drawing from highly experienced, practicing artist Rod Coyne. From absolute beginners to experienced painters all are catered for. Our Winter Painting Course is an ideal chance for those who have dabbled and would like to learn a few more techniques. Rod will demonstrate and explain all techniques and his suggestions relating to medium, composition, colour-mixing and brushwork are on hand in a friendly environment. Rod Coyne is a highly experienced, practicing artist and has over 25 years experience working in the studio and en plein air (outdoors). Rod studied at the Dun Laoghaire College of Art, Dublin, later graduating in 1990 from the Crawford College of Art, Cork. He spent ten years honing his skill in his Dusseldorf studio during the nineties. The new millennium saw his return to Ireland and the beginning of an ongoing conversation with the magical Irish landscape. In 2003 he founded the Avoca Studio Gallery and Avoca Painting School in 2010 firmly planting his roots in the Wicklow Mountains. Rod exhibits on the international stage and his paintings grace public, private and corporate collections literally worldwide. 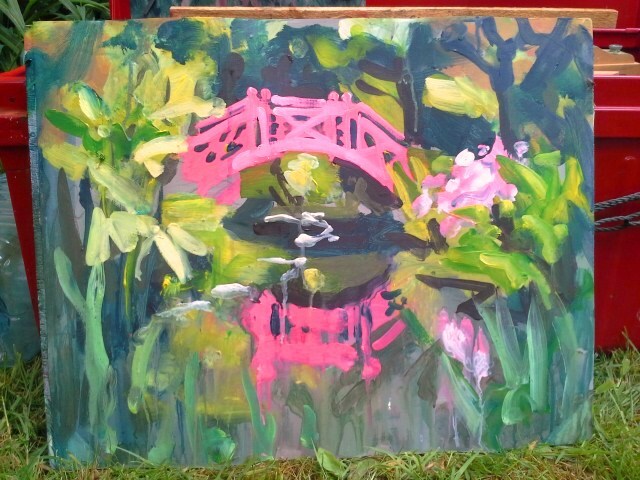 See recent Avoca Painting School students work on Facebook. See Rod Coynes’ painting demos on YouTube. Send a friend a Painting Course Voucher. The Avoca Painting School presents Rod Coyne’s November Painting Course at the Avoca Studio Gallery which runs over a 6-week period. The classes are suitable for beginners and advanced painters. November Painting Course Early bird discount! Book 3 weeks in advance and save €20. Our November Painting Course is an ideal chance for those who have dabbled and would like to learn a few more techniques. Rod will demonstrate and explain all techniques and his suggestions relating to medium, composition, colour-mixing and brushwork are on hand in a friendly environment. The Avoca Painting School presents Rod Coyne’s September Painting Course at the Avoca Studio Gallery which runs over a 6-week period. The classes are suitable for beginners and advanced painters. September Painting Course Early bird discount! Book 3 weeks in advance and save €20. Our September Painting Course is an ideal chance for those who have dabbled and would like to learn a few more techniques. Rod will demonstrate and explain all techniques and his suggestions relating to medium, composition, colour-mixing and brushwork are on hand in a friendly environment. The Avoca Painting School presents Rod Coyne’s Autumn Painting Course at the Avoca Studio Gallery which runs over a 6-week period. The classes are suitable for beginners and advanced painters. Autumn Painting Course Early bird discount! Book 3 weeks in advance and save €20. Our Autumn Painting Course is an ideal chance for those who have dabbled and would like to learn a few more techniques. Rod will demonstrate and explain all techniques and his suggestions relating to medium, composition, colour-mixing and brushwork are on hand in a friendly environment. Rod Coyne hosts our Painting Holiday 2017 and this year’s will be 17th till 21st July 2017 at stunning painting locations in County Wicklow. Avoca Painting School’s Painting Holiday 2017 allows you to develop your creative side in the midst of the Wicklow Mountains in the heart of the “Garden of Ireland”. The week is tailored for absolute beginners and experienced painters. Whether you’re starting out and would like to learn new techniques, or have been painting for years and want to take it onto the next level this course is for you. Participants will take home much more than their new creations – working outdoors gives a natural feeling of achievement, fulfillment and recharges the human batteries. 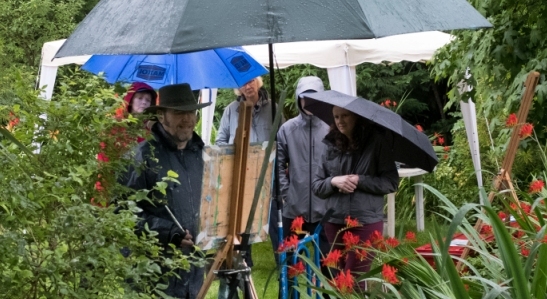 The Avoca Painting School presents Rod Coyne’s May Painting Course at the Avoca Studio Gallery which runs over a 6-week period. The classes are suitable for beginners and advanced painters. May Painting Course Early bird discount! Book 3 weeks in advance and save €20. Scroll right down for tickets. 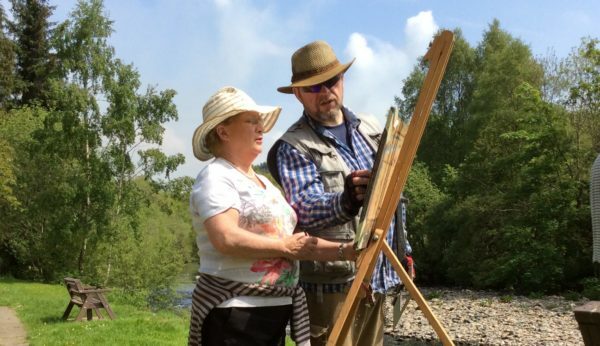 Our May Painting Course is an ideal chance for those who have dabbled and would like to learn a few more techniques. Rod will demonstrate and explain all techniques and his suggestions relating to medium, composition, colour-mixing and brushwork are on hand in a friendly environment.